As the Canadian economy gains steam, we will soon be in a tight employment market, meaning you will have to work to attract great people to your Winnipeg business. Generation Z are now part of the workforce, and combined with millennials will make up the majority of Manitoba workers for the next 20 years. With this huge shift in the workforce, you will have to be in the forefront of office design and ergonomics in order to compete effectively for talent. This can be one differentiator that will have a profound effect on your talent pool. 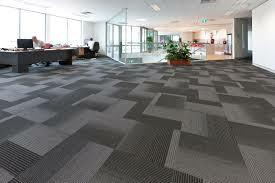 A cost effective way to design your workspace should start with your office floor. Flooring options are now leading the way to create the right mood for your workspace. Colours and design on the floor can create a positive psychology for your team. Studies have shown that colors don’t just change our moods, but also profoundly impact productivity and interest levels. Bright colors and futuristic design, give energy and foster creativity. To take advantage of the psychology of the office space, you should consider carpet tiles as an attractive option to create interesting and energetic patterns. Combine this with eco – friendly combinations of bamboo and concrete and you will show your team that you care about the environment both inside and outside the workspace. Talk to the experts at Studio Flooring to get connected to the best design options for your commercial flooring project. We offer a complimentary flooring design consultation to bring your office to life! How Does Vinyl Planking Really Hold Up After a Few Years? 2018 – Year of the Plank.